Most of us have heard of craft beers, but how about craft spirits? The former Barrel Factory on Vandalia Street in Buffalo's Old First Ward has been restored into a new multi-use commercial hub, anchored by the city's newest and largest craft beverage maker. It is open to the public for tours all weekend. It is a privately funded project that used reclaimed materials from the 1903-built daylight factory and, at the same time, is helping restore the community. "The building had been not maintained for several decades. The roof was in very bad shape. People who've been in it complained that when it was raining outside, it was raining even harder inside," says Chris Sasiadek, co-owner of Lakeward Spirits. "But we lovingly restored it and people who come down to take a tour of the distillery will really see how we creatively re-used a lot of the old parts of the building to create something new." Sasiadek is a Buffalo native, who worked in Washington, D.C. as a teacher, a salesman and in politics, but was looking for a more fulfilling career. That led to coming back home to the City of Good Neighbors. 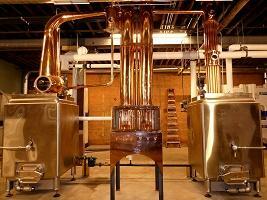 Lakeward Spirits' stills are custom-made copper, hand-crafted by its head distiller. "Restoring this 113-year-old building was our greatest challenge. I don't even know how much has been invested. But my wife and I and our investing partners wanted to make something physical with our hands," Sasiadek says. The new distillery produces craft vodka, available for sale now, and will soon expand into gins and other craft spirits. All are produced with Western New York grains. "We're committed to purchasing as much as possible from local family farms. Currently, 100 percent of our grain is from local maltsters," says Sasiadek. "It costs us a little bit more to get that grain, but farmers are getting a new way to diversify their crop, which is good for them. It gives them a little more security from year to year and it's a new source of income for them," he says. Sasiadek says all of the distillery's equipment is made in the USA as much as possible. It boasts two 1,000-gallon mash tun - in which the water is extracted from the grains - two 1,000-gallon fermenters, two 550-gallon fermenters and two custom-made copper stills, hand-crafted by Lakeward's head distiller. The newest addition to Buffalo growing craft beverage market is open from noon to 10 p.m. through Saturday and until 5 p.m. on Sunday. Also located in the building and now open are Elevator Alley Kayak and Snowy Owl Kombucha.